1. This soft flutter tee that comes in three summer colors is 50% off. 2. I really like this utility shirt dress that is an additional 50% off. 3. This striped sleeveless blouse with a fun bow detail is on sale for $25. 4.These mules are 50% off - and come in a fun metallic gray, as well as tan and black. 5. I think sleeveless vests are so trendy - and this one is marked down to $26. 6. I keep thinking about getting a chambray blazer like this one that is on sale. 7. I like the mixing of lace and knit and this sweater is under $30. 8. These chunky low heel lace up sandals come in a pretty blue suede (and other colors). 9. These lace sneakers are on sale for under $50. 10. One of my favorite lipsticks is buy two, get one free right now. Express has up to 70% off sale items - like this cold shoulder bell sleeve sweater that is only $14. Macy's has some great deals like this KitchenAid Mixer that is over $100 off. And, J. Crew has up to 50% off sale items, like this striped beach cover up. Photo Credits: Left / Middle / Right - I am participating in the following link-ups. The #7 sweater for less than $30 is goals! Love that one. So in love with that yellow sweater and white look. Perfect inspo! so many great sales my wallet is shivering! 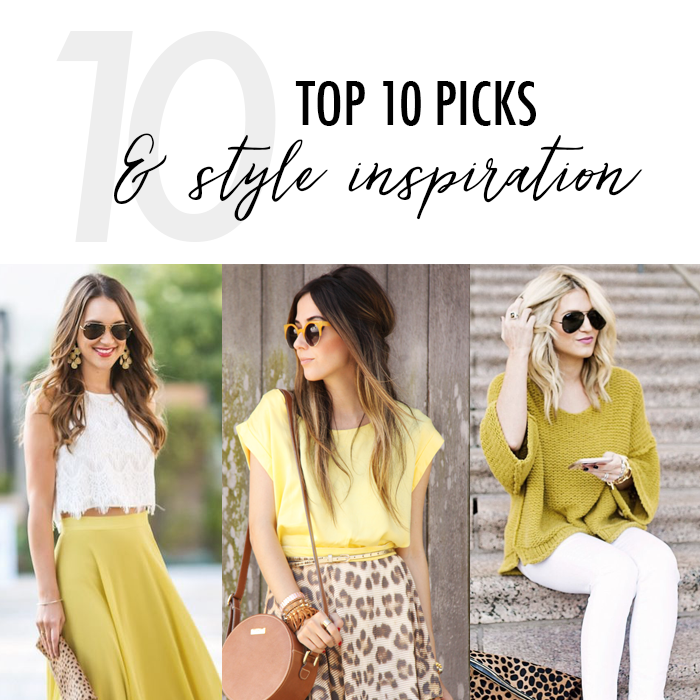 I love the yellow top with leopard skirt!